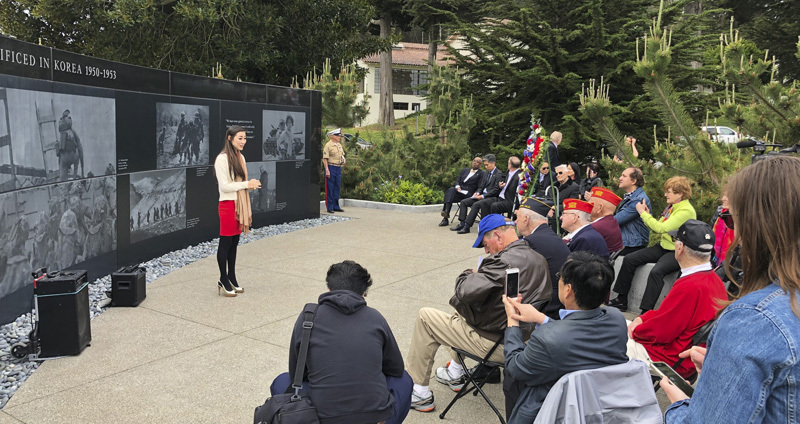 On April 28,2018, Korean/American Hannah Kim made the first stop on her journey to visit Korean War Memorials in all continental States (including Alaska) at the memorial in the Presidio of San Francisco, CA (http://remember727.org). Hannah Kim, a tireless advocate for Korean War Veterans, founded Remember727 in 2008. In 2009, Hannah successfully lobbied to pass legislation that established July 27th as the National Korean War Veterans Armistice Day in the United States. She most recently has worked as chief of staff and communications director to Rep. Charles B. Rangel. The goal of this journey is to raise awareness and funds to help build a Wall of Remembrance at the National Korean War Memorial in Washington, DC to honor those who made the ultimate sacrifice and remind us all that "Freedom is not Free". Although the Wall of Remembrance Act was passed by Congress in 2016, plans to build the wall have languished due to a lack of initial funds. The goal is for the Wall of Remembrance to be built as soon as possible so that as many Korean War Veterans can attend the dedication ceremony. 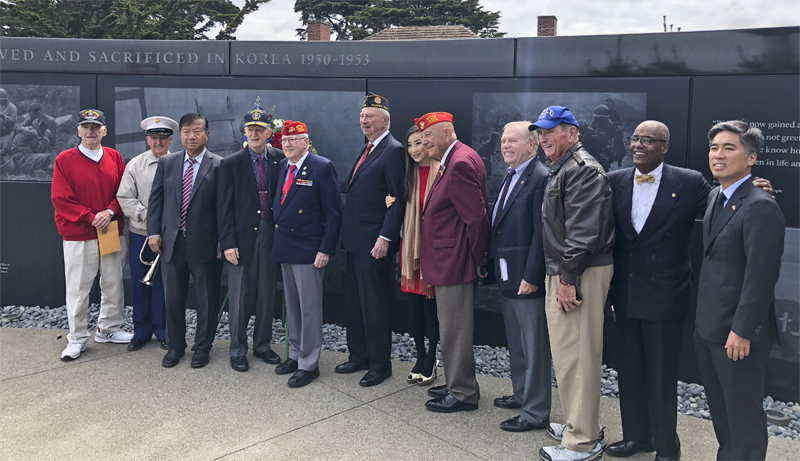 The July 28th Wreath Ceremony was organized by the Korean War Memorial Foundation (KWMF), http://www.kwmf.org, a non-profit organization which raised funds for the San Francisco Korean War Memorial and completed the project in 2016. The ceremony began with a welcome and introduction from KWMF Executive Director, Gerard Parker, and was followed by an Invocation from Chaplain, 1st Marine Division Association, William D.Weisgerber. The National Anthem of the United States of America and the National Anthem of the Republic of Korea were sung by Noah Griffin and Joanne Cho, respectively. Judge Quentin L. Kopp, KWMF President and Chairman, gave remarks concerning the need to tell America about the Korean Conflict. 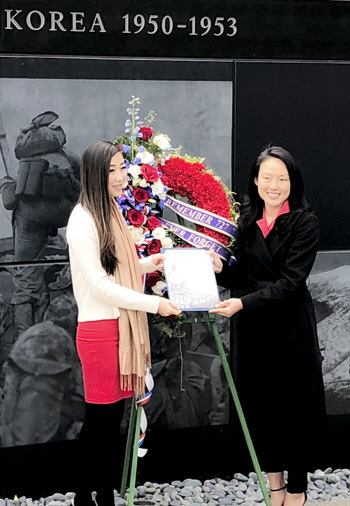 Hannah Kim spoke of her deep appreciation to all Korean Veterans, saying how she never would have been born without their service, and none who gave the ultimate sacrifice should be forgotten. She demonstrated her gratitude with a deep Korean bow. Then Ms. Kim and Judge Kopp laid a wreath at the memorial. The Presidio is in San Francisco District 6, and Distict 6 Board Supervisor, Jane Kim, presented Hannah Kim with a Certificate of Honor. Man J. Kim, first KWMF Vice President and San Francisco restaurateur who annually hosts the Korean War Veterans Appreciation Dinner at his Golden Gate Grill restaurant, spoke about the importance of memorials and jokingly indicated the child in the San Francisco Korean War Memorial was him, pending DNA verification. Chaplain Weisgerber gave the Benediction and Wallace Stewart of KWMF played Taps. Gerard Parker closed the ceremony. Contributions to the Wall of Remembrance can be made to the Korean War Veterans Memorial Foundation (not to be confused with the KWMF) directly through the Remember727 website. On Monday, July 23, 2018, Hannah Kim will visit the Frederick, MD Korean War Memorial. The Knights of Columbus organized a Field of Honor over Memorial Day weekend on the grounds of Saint Ignatius Catholic Church. With the help of Colonial Flag Foundation and local Boy Scout Troops, the Frederick Knights of Columbus displayed over 600 flags. Each US flag is poly-cotton measuring 3 feet by 5 feet and made in the U.S.A. The flags are sponsored and dedicated by individuals or organizations. KWVA Chapter 142 sponsored two flags. Flags are purchased at $40 each ($20 for the flag and $20 for the cause), and can be saved for display in the following year at a cost of $20 each ($20 for the cause). Last year (2016) KWVA Chapter 142 purchased two flags for $80, and this year (2017) displayed them for $40. The event benefits homes for veterans who are suffering from PSTD and other issues that have brought them to become homeless. 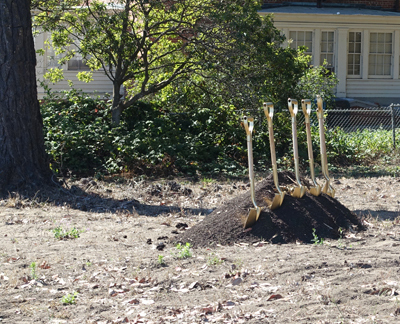 The homes provide shelter, counseling and job support. 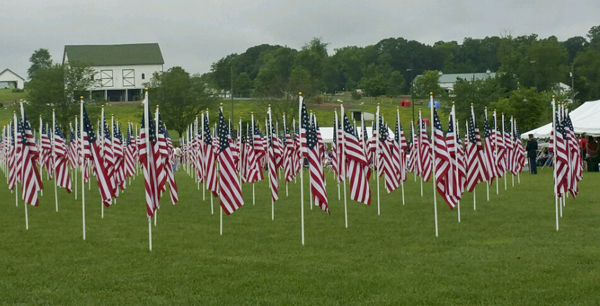 The event also benefits the community - no one can walk among the flags without being moved. The Korean War Memorial in Washington, DC was not the only place on July 27, 2016 where those who fought in the Korean War were honored. In DC, Col. William Weber organized a tribute to the Koreans of the KATUSAs who died during the war. In a moving ceremony, Col. and Mrs. Weber, assisted by members of the KWVA Chapter #142, read the names of over 7,000 KIA and MIA KATUSAs. On this same day in London at their Korean War Memorial, a US Marine Corps horse, Sgt. Reckless, was posthumously honored for her bravery during the battle for Outpost Vegas in 26 - 30 March, 1953. She was a Mongolian mare bought for $250 by Lt. Eric Pedersen. She carried ammunition for 75 MM recoilless rifles up the steep 45% mountain and retrieved the wounded troops of an anti-tank unit of the 5th Marines during the heavy shelling of Vegas. She did this 95% of the time without any assistance, making more than 51 trips in one day alone, doing her duty as she had been trained to do. She was wounded twice in this action, and later received two Purple Hearts. Marines Bob Hilton and the late Bob Hertfelder both witnessed her heroics. Bob Hilton heard her first before he saw her, and suspected enemy infiltrators...but was shocked to see the valiant Sgt. Reckless on her courageously mission. Sgt. Reckless, who died in 1968, was awarded the Dickin Medal, the animal equivalent of the Victoria Cross, by a grateful United Kingdom. Since it was first awarded in 1943, one half of the recipients have been dogs, one a "commando collie" who made more than 20 parachute drops. Carrier pigeons have also been honored for their service, as well as a ship’s cat that did a yeoman’s job of catching rats during the 1949 shelling of his ship in China. Edward J. Chow, Jr. died 22 July, 2016 of pancreatic cancer. Born in New York City in 1939, he was raised in Seattle where he attended the university. He then was commissioned a 2nd Lt in the US Army, serving in Germany before volunteering for Vietnam. There he served in combat as a Captain and was awarded the Bronze Star. Chow subsequently went into business, later serving Washington State by managing their disaster response teams, including the eruption of Mt Saint Helens. In 1993 he was appointed Deputy Assistant, Secretary for Policy at the US Department of Veterans Affairs. Most recently he was Maryland’s Secretary of Veterans Affairs from 2009 to 2015. 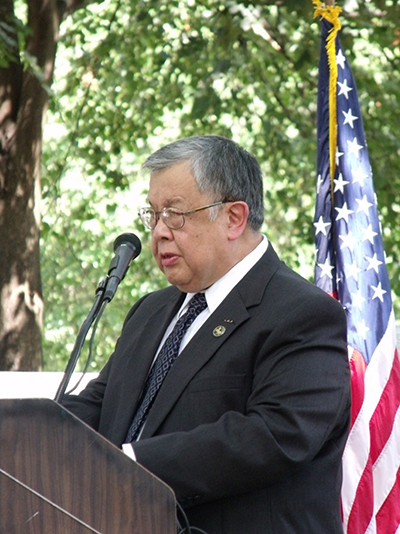 In this capacity, he attended and spoke in Frederick at Memorial Park on the 60th Anniversary in 2010, an event sponsored by our own KWVA #142. A tireless advocate for veterans, he was Washington State’s president of Vietnam Veterans of America, a member of the American Legion, AMVETS, Disabled American Veterans, the VFW and other veterans’ organizations. The proud son of the late Ruby and Shu Ping Chow, he is survived by his partner, Sara McVicker, son Dr. Ward Chow, daughter Dr. Elizabeth Chow, 6 grandchildren and three brothers. Former Sec. Chow will be buried at Arlington at a later date. 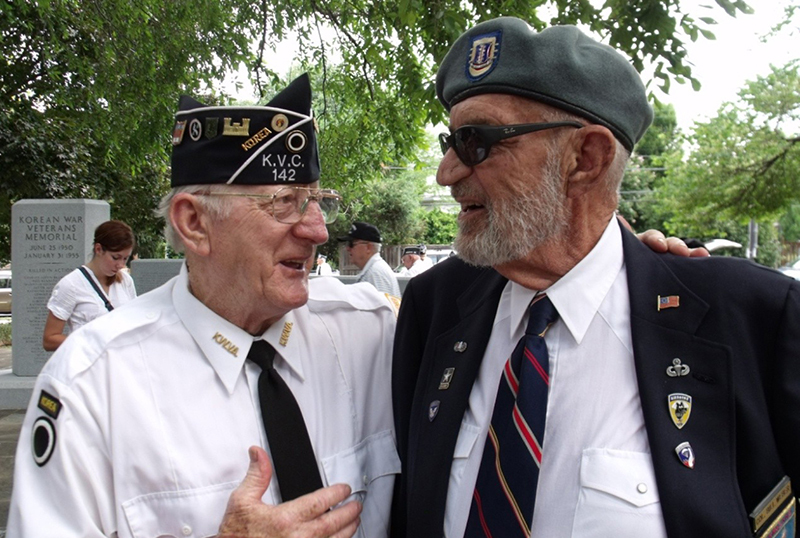 On 25 Jun 2015 the KWVMFnd [Korean War Veterans Memorial Foundation] sponsored a ceremony, at which we read at the Korean War Veterans Memorial the names of the 36,574 U.S. Soldiery KIA in the Korean War. Unknown to our people is that Republic of Korea Soldiers were assigned to U.S. units during the war due to a shortage of trained U.S. replacements. KATUSA combat losses would otherwise have been U.S. They were called Korean Augmentation To U.S. Army (KATUSA). Approximately 25% of U.S. Army combat and combat support units were KATUSA. Over 23,000 KATUSA served during the war and continue to do so today in the 2nd U.S. Inf Div. Of these, during 25 Jun '50, to 27 Jul '53, 5936 were KIA! That's a ratio of almost 1 in 5 vs a U.S. ratio of 1 in 9 - almost twice as much! Irrespective of the ratio it is fair to assume every KATUSA KIA could otherwise well have been a U.S. Soldier! Ergo, in honor of their sacrifice and the U.S. Soldiery lives they saved, this past 25 Jun 2016, we read the names of these KATUSA KIA, just as we did their U.S. counterparts last June. The 'reading symbolism' used was to have the name read first by a Korean (KATUSA vet, ROK Embassy military aides, Korean-American KATUSA veterans, Korean-American ROK Army veterans) and then by U.S. Korean War Veterans Association member, my Board members and active U.S. military members. Readers were paired - a Korean national or Korean-American would first read the name in Hangul (Korean language), followed by an American reading the name in phonetical English. This process continued unabated for almost seven hours until all 5936 names were read! Members from Chapters 33, 100, 142, 312 and 313 participated as 'readers' as did Tom Stevens (new President), and others from KWVA Board. To those of you who supported this ceremony, my thanks! But, let me get to the reason for this short and, strangely named, article - for sometimes, 'Fact, Stranger? Than Fiction!' can be so! One of the reading pairs was a Korean-American KATUSA war veteran, Wondo Chang and his partner, Robert Mount, currently President of KWVA Chapter 142 in Frederick, MD. And it is at the juxtaposition of 'reading pairs', chosen at random, that the title of this article became manifested this past 25 Jun! 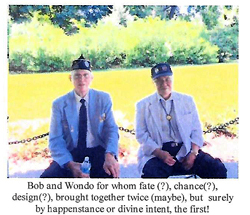 KATUSA veteran Wondo Chang, and KWVA veteran Robert 'Bob' Mount were again (Note: I'm a firm believer that 'coincidence' is sometimes pre-ordained! ), 'paired', though this time somewhat more intimately, as 'readers' to read together. But, unbeknownst to all, that day and 66 years earlier, the TWO had also been 'paired' though unknowingly, (and somewhat indirectly), in a combat related activity in Korea in late Sep-early Oct 1950! Col. Warren Wiedhahn (Ret.) points toward the Golden Gate which was the last sight of America for thousands of soldiers as they shipped out to Korea. 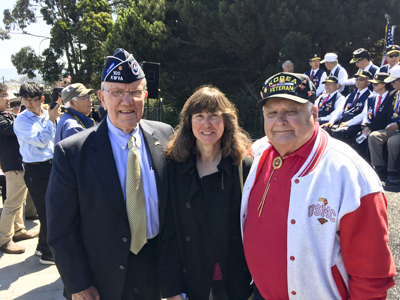 Representing Chapter 142 in San Francisco, Glenn Wienhoff's daughter, Linda Crilly, and her husband, Jeff Crilly, attended "The Groundbreaking Ceremony for the Korean War Memorial" on July 11, 2015 in the Presidio at the gates of the San Francisco National Cemetery. 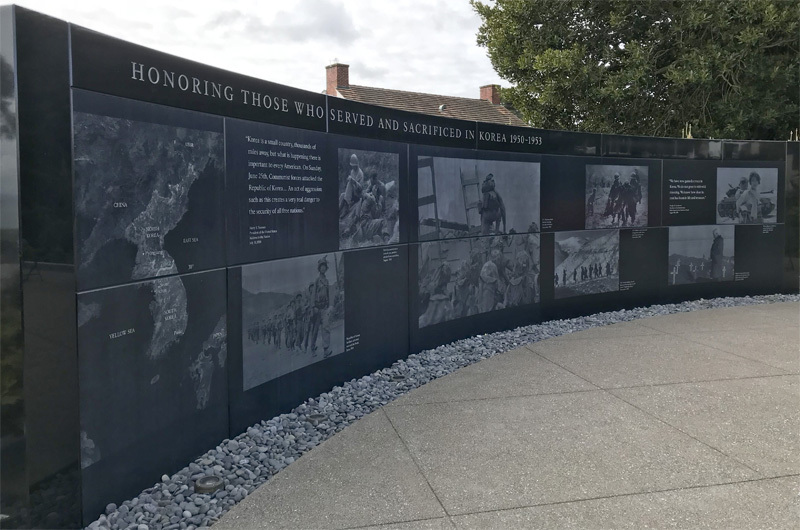 This Memorial is the first of its kind on the West Coast and is the culmination of the efforts by the Korean War Memorial Foundation. The Memorial will remember the 36,914 United States soldiers (2,273 of whom rest in the National Cemetery at the Presidio) and the 113,248 South Korean soldiers who gave their lives to keep South Korea free. A copy of the program can be viewed by clicking here. Over 100 dignitaries, veterans and guests attended the ceremony. Of the dignitaries were UN representatives from Luxemburg, India and the Philippines; San Francisco Mayor Ed Lee and his wife; The Honorable Park Sung-choon, Minister of Patriots and Veterans Affairs, Republic of Korea; The Honorable Kim Jung-hoon, Member, National Assembly, Republic of Korea; The Honorable Han Dong-man, Consul General, Republic of Korea; and Col. Warren Wiedhahn USMC (Ret. 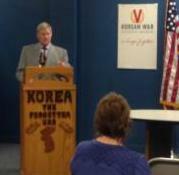 ), First Vice President of the Korean War Veterans Association. Former Secretary of State George Shultz and his wife, Charlotte, also attended. Former Secretary of State George Shultz gave accolades to Former President Eisenhower for supporting the South Korean people and told an anecdote about Former President Ronald Reagan. Mayor Ed Lee pledged assitance to veterans in San Francisco so that none would ever have to face homelessness. The Honorable Kim Jung-hoon, who flew in from South Korea expressly for the ceremony, presented a check for $1,000,000 to The Honorable Judge Quentin Kopp (Ret.) 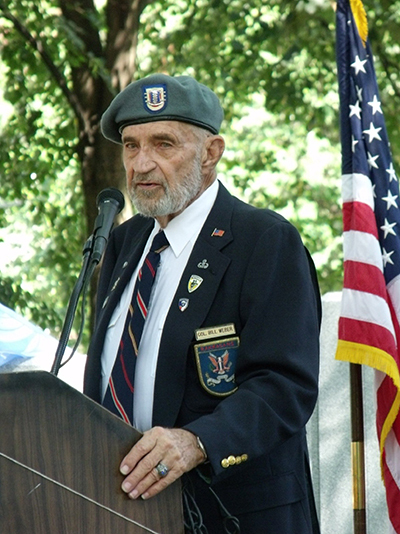 Captain, USAF, President of the Korean War Memorial Foundation. The Honorable Park Sung-choon spoke of the mobilization of the Korean community in America in support of the Korean War Memorial in San Francisco. Col. Warren Wiedhahn spoke about the historic significance of San Francisco to the Korean War, remembering his departure for Korea on a ship through the Golden Gate. He also returned through the Golden Gate and was stationed at Treasure Island receiving the wounded and dead, reiterating San Francisco's role in the conflict. All speakers looked forward to a day when both Koreas may peacefully reunite. View from The Presidio Nation Cemetery facing the Golden Gate Bridge and San Francisco Bay. The Museum welcomed visitors of all ages and from various areas of the city, state, country, and world. Students from Millburn, Illinois made a visit, and middle school and high school students in Springfield Public Schools Summer Program scavenger hunt looked for facts about the Korean War. We also enjoyed visits from members of the FFA and AMVETs as they held their annual conventions in Springfield. 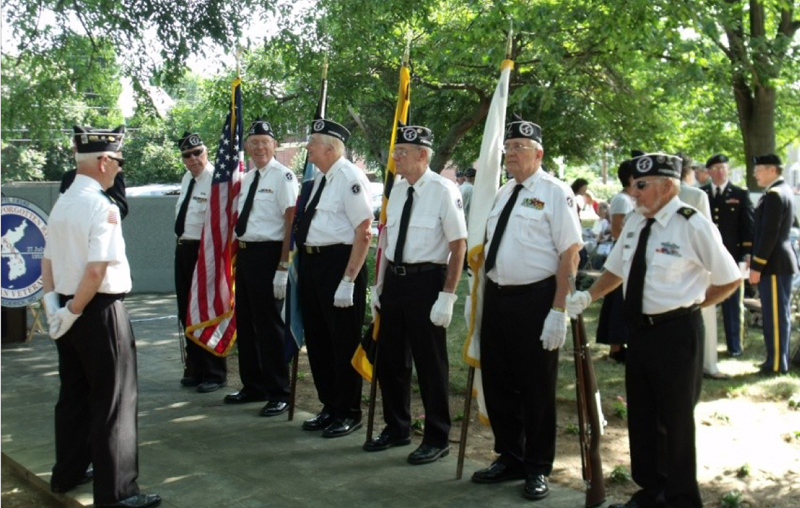 Members of the VFW also enjoyed the Museum in June. We held our third Speaker Series event June 25 with the presentation of Forgotten Soldiers from Our Forgotten War. Chicago actor Frank Farrell's presentation included an emotional reading of several letters from his new book Forgotten Soldiers from Our Forgotten War: Letters from Korea from 1951 - 1953. Of the several young soldiers' letters featured in Forgotten Soldiers from Our Forgotten War, Frank chose ones written by Corporal Edward F. Hines. His letters illuminated what it was like to be a young soldier serving overseas during the Korean War. Mr. Farrell has been an actor and director in Chicago since 1979, as well as an author, playwright, and filmmaker. The Museum welcomes groups and speaking opportunities. 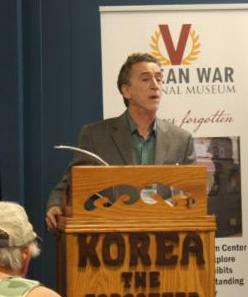 If your group would like to learn more about the Museum and Korean War, contact tkenny@kwnm.org or call 217-523-7230. 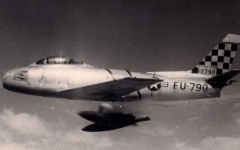 June 6, 1952-Start of Operation Counter. Counter was the securing of 11 key areas along the front line. When the soldiers were able to grab some down time away from the fighting, they would engage in many activities to take their minds off the war. Some would just simply listen to music. One song that some veterans remember from their time was the song, China Night. Other soldiers would find other activities to occupy their time, such as a game of checkers or decorating for the holidays. This resource contains letters from many American wars including Korea. It contains dramatic eyewitness accounts from the front lines, poignant expressions of love for family and country, insightful reflections on the nature of warfare. There are accounts from soldiers, nurses, and journalists among others. The letters are an astonishing historical record, a powerful tribute to those who fought, and a celebration of the enduring power of letters. 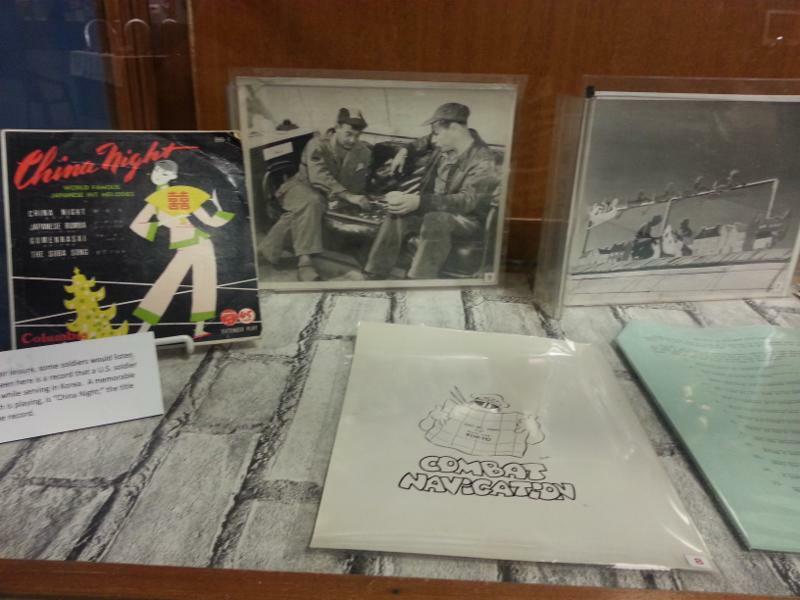 The KWNM Library includes a wide array of books, magazines, photos and other resources relating to the War. After being disbanded in 1947 due in large part to a lack of funding, the USO was reinstated in 1951. From 1952-53, the USO provided services and support on a daily basis to American troops in Korea. During the year of 1952, it provided service to roughly 3.5 million people using the same services it had utilized in WWII. Many American movie stars and athletes contributed as well. Big names such as Bob Hope, Marilyn Monroe, Mickey Rooney, Jane Russell and Debbie Reynolds all performed shows or visited troops while overseas. Today, many veterans recall USO events in vivid detail. Plans are being finalized for our 2016 Speaker Series on a wide array of topics. 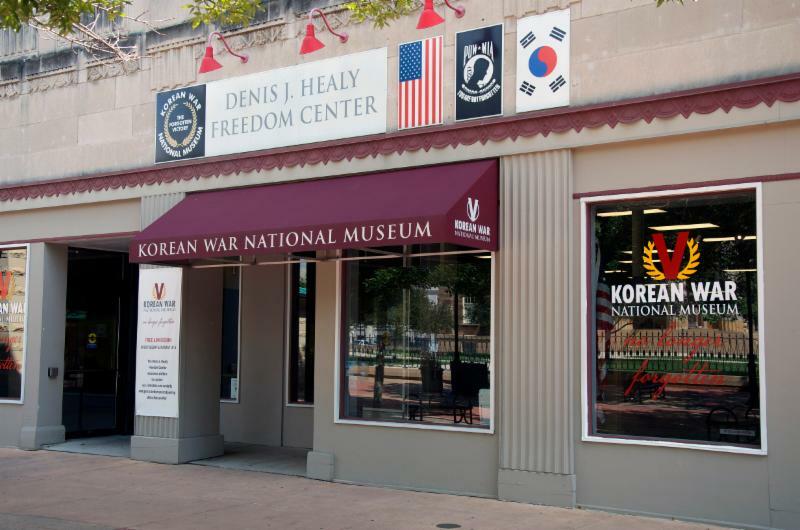 The next event is July 23 at 2pm at the Denis J. Healy Freedom Center in Springfield, IL featuring Dr. Bonnie Oh presenting American Occupation of South Korea. Immediately following WWII, South Korea was under the rule of the American Military government for three years: 1945-1948. To be subjected to another foreign rule after being liberated from the harsh Japanese colonial rule of 35 years was a humiliating shock to Koreans. Considering the magnitude of disappointment Koreans experienced, however, the subject has been awfully neglected as a field of study. A multitude of reasons exist for this lack of interest in serious examination of the topic. Lodged at the outset of the liberated Korea, however, the American Military government played an important role in laying the foundation for non-Communist South Korea, which evolved into a democratic and economically vibrant South Korea. This presentation will survey the origin, accomplishments, blunders, and consequences of the rule of American Military Government in Korea. It is not based on new research, but the result of a fresh look at and synthesis of existing materials. Dr. Oh was born and raised in Seoul, South Korea, and came to the US in 1956. For 38 years, she served as professor and academic administrator in American higher education. Attendees will have a chance to ask questions following the presentation at this informal event. Students, educators, and media are welcome and encouraged to attend. Visitors may also review the Museum's memorabilia, uniforms, and artifacts. The KWNM encourages the public to visit the Museum to learn about the history of the conflict, its veterans and the Armistice, now more than 60 years since its signing. The Museum aims to bring to life the stories of individuals who served and partnered with nations around the world, providing insight to the challenges and accomplishments of the allied nations who fought against communist aggression. The KWNM further strives to recognize how the United Nations, United States, Republic of Korea, the Democratic People's Republic of Korea and China negotiated the Armistice. Read more about the Speaker Series. Click here. We continue to educate the public and donors of the relevance and importance of recognizing those who not only enabled democracy but were change agents for our current world's economic and technological impacts. 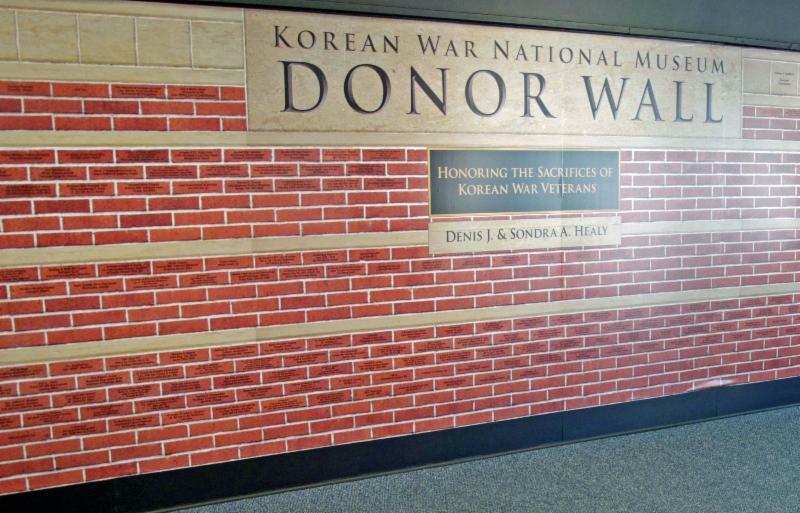 The Donor Wall in the Denis J. Healy Freedom Center continues to receive interest, and we welcome our new donors to this growing recognition program. We recently added several new donors to this program who now have a presence on the wall. 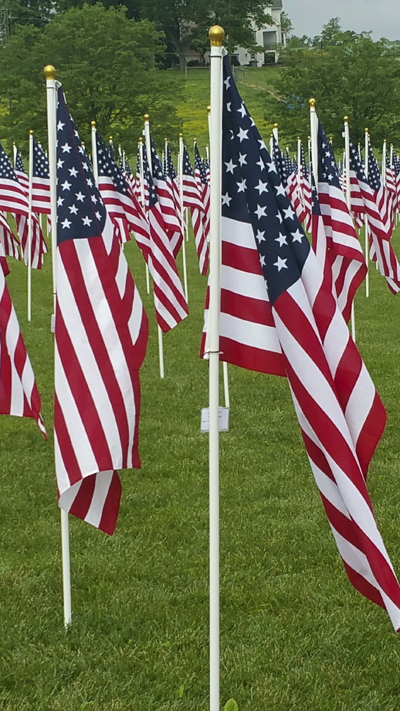 We appreciate everyone who supports our efforts to honor those who served. Tuesday-Saturday 10 a.m. - 5 p.m.
Additional hours for special events. Hours subject to change. If visitors or groups need accommodations outside those hours, please contact us.